I always thought he was more of a musician. Stockhausen's music sounded more musical than Pierre Boulez, when you listen to piano pieces like Klavierstücke I–IV. So musical, really swinging. The third practically sounds like a blues riff, even though it's completely atonal and serial in nature. You can tell that this guy is a real musician. Sure enough when he was in the army he always played the piano, and I can really feel that in his music. 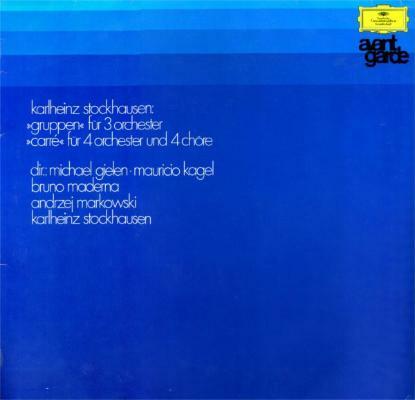 Stockhausen is crazy in a really good way, and that comes out in his music. The reason I picked Gruppen is because it's through that piece that I got the idea of working antiphonally. There are three orchestras surrounding audience. So I thought back to that piece when writing A Crimson Grail. The idea is simply that we needed enough guitarists to surround the audience and create that antiphonal effect. The first time we did it was at the Sacré-Cœur in Paris, which is so huge and the delay time is massive. People ask, "How come there are no drums in A Crimson Grail?" It was composed for the Sacré-Cœur, and the delay time there is 15 seconds. If I put drums in that, one hit of a snare and it doesn't go away for 15 seconds. So I wrote the guitar parts with the delay mechanism in mind. I thought I would need 400 guitarists and put out a call, but only 126 showed up. 126 was fine in the end. How ever many it takes to surround an audience – that came from Stockhausen.